Marcus Sedgwick has literary chops. Here’s an author who knows his way around a sentence. Last year, Karyn and I predicted that Sedgwick’s Midwinterblood would get a shiny sticker, despite our reservations about the novel’s ability to hold up under close scrutiny. We agreed that Sedgwick’s beautiful use of language and the book’s complicated structure would be enough to put it in the winners’ circle, so neither of us were surprised when Midwinterblood won Printz gold. 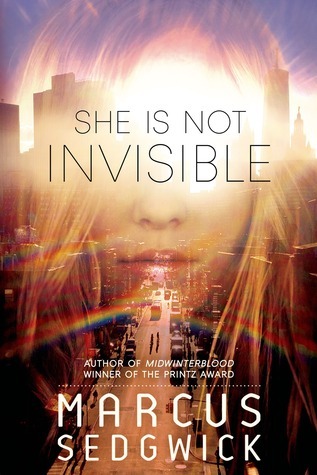 Sedgwick’s followup, She Is Not Invisible, isn’t likely to repeat its predecessor’s success. That doesn’t mean, however, that it’s a disappointment. In terms of critical response, it’s on Kirkus‘ best list for 2014 and has received three stars. It’s an interesting and satisfying reading experience, displaying some of the technical skills one expects from Sedgwick. Compared to the rest of 2014’s contenders though, it falls just below the best work of the year.